How can digital media be researched and accessed in libraries? An interview with Harald Reiterer from the University of Constance. Mr Reiterer, when it comes to sharing digital content and resources, what are the new developments your research projects are focused on? We are going through a transformation phase at the moment – a phase in which we are moving away from the analogue world and more into the digital world. In both public and research libraries the question arises how we can present digital media to users who are used to the quality of the traditional open access library. And – how can electronic books be made researchable at all? Within the framework of a project entitled Blended Library (2011 until 2014) a large-scale survey was conducted – over half of the respondents said that they did not want to forego rummaging and browsing through books on library shelves. It was that that prompted our project to come up with the Blended Bookshelf. The Blended Bookshelf shows how the qualities of an analogue bookshelf can be combined with the advantages of the digital world, by making the digital media accessible by means of a visual, haptic experience – an experience that could up to now only be had when browsing through books on a real bookshelf. The Blended Bookshelf is now already being further developed for commercial purposes. Your pilot project, Quellentaucher, combines digital researching with analogue resources. How do users go about doing this? According to the survey we carried out, when it comes to research sources, online and web search are at the top of the list and not online catalogues. This is why we have to start thinking more about developing new visualisation concepts that will contribute to making accessibility more democratic. Many OPACs (online public access) available in libraries are, in my opinion, more of a deterrent for the library users. It is all about utilising the rich store of data that is to be found in OPAC. In public libraries Quellentaucher provides two innovative forms of access for this: we called the first one Expedition and with the aid of a large touchscreen it offers an integrative range of services. “Integrative” means they can use both analogue as well as various digital sources, not only online catalogues and OPAC. The world has a lot more to offer than what OPAC offers – our digital daily routine is embedded in Wikipedia, Twitter, Facebook, reviews and the news of the day. With the help of an electronic bookshelf all this information can be augmented and enhanced with the resources available in the local library. Prof. Dr. Harald Reiterer | © Harald Reiterer We named the second form of access Tiefenrausch. In a playful, entertaining way it offers the user the possibility of addressing OPAC with complex queries. For this process we use physical search building blocks that are used as filtering blocks when entering search terms on a touch-sensitive desk or screen. In addition it can also be used to implicitly formulate complex queries (for example, linked with UND and/or ODER) – and this is all done very simply and without the help of a librarian. The search results are then shown on a large, touch-sensitive wall screen. A further pilot project is the Blended Library – which users does this research option address? The Blended Library primarily addresses academic users of research libraries – for seminar papers, homework assignments and theses and dissertations. Its aim is to support the process of researching, from the actual extracting of information to its presentation. In principle, what we have done is to reconstruct the workflow of an academic undertaking. Our Integrative Workplace unit enables users to place analogue books on an interactive desk and then with a digital pen to drag them out of the book and on to the desk. They can, so to speak, bring the analogue world directly into the digital world. In more concrete terms, how does this work? For example, you can draw yourself a mind map and develop a structure for a seminar paper. Collaborative research systems allow people to work together. Four people can carry out research at the same time. For this, however, the combination of interactive desk and Tablet PC is important – the Tablet PC is more for individual research and the desk is more suitable for collaboration. A user’s individual results can be transferred from the Tablet PC back onto the desk and can be seen by the others. The results are stored and can then be processed for further use. A librarian, for example, can help to develop more targeted research strategies. With such interactive desks, Tablet PCs and software we want to provide libraries with an infrastructure that is not available on normal PCs and laptops. 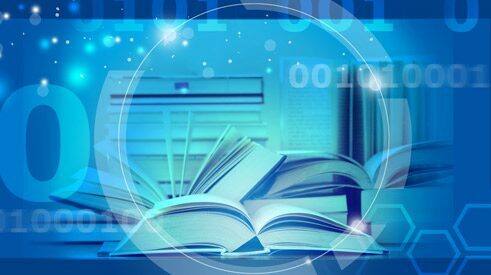 This will endow the libraries with a totally new quality – academic and scientific work will be supported in a way that up to now has not been possible on conventional computers. Has participatory access also been taken into account? Within the framework of a Master’s dissertation for the course in Computer and Information Science at the University of Constance a recommendations machine named bibox has been developed. It has been tested as part of a Quellentaucher project in a public library in Cologne. The bibox recommendations machine was set up next to the return machine. Before a book is returned, it can be placed on the recommendation machine and a recommendation can be written. The book is assessed by means of stars, between one and five, questions are asked on how you evaluate the book emotionally and your personal comments can be added. As a reward for making a recommendation the machine then recommends two, four or six books that are similar in content to the one you have just read – the first book is, so to speak, a stepping stone to the next book. Even for just a little feedback the user is given two recommendations as a reward. Quellentaucher and the recommendation machine are measures that public library users, in particular, can “play” with. The idea behind them is to offer new forms of access on an integrative level, to include other media, for example, the news of the day, but also to make use of the recommendations other readers make – very much in the spirit of the participatory library. Where do you see your pilot projects in the future? Here in Constance a new building was built to house the library, it opened in autumn 2015. It is equipped with new furniture, new rooms, the commercial version of the Blended Bookshelf that goes by the name of Hybrid Bookshelf and is an alternative form of browsing and searching, along with a media laboratory for library users and lecturers. This is where new accessing strategies are to be developed, in order to bring the analogue world more in line with the digital world. We hope our work will show the way forward for other libraries. Quellentaucher, for example, is already being tried and tested at the moment in Cologne Municipal Library. 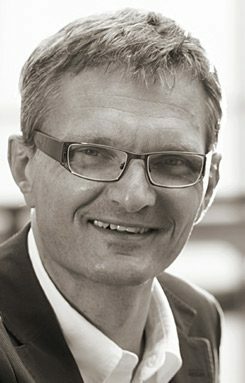 Since 1997 Harald Reiterer has been Professor for Human-Computer Interaction in the IT faculty of the University of Constance. From 2011 to 2014 he headed the Blended Library project. From 2013 to 2015 he managed the Quellentaucher research project in cooperation with the North-Rhine Westphalian Ministry of Education. The library for the pilot scheme is Cologne Municipal Library.